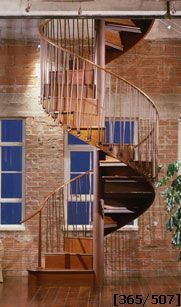 This is a custom hand crafted mahogany wood stairway with steel balusters built to the customer’s specifications. The handrail is # 243 (1 1/2" rd mahogany) and treads are a # 142 (1 1/2" thick) with a bull nose and close riser plates. The wood stringer was hand made with a custom cut showing the open riser. The center column is a 5 1/2" round solid wood. The balusters are hand forged to fit on the side of the stringer and position. The finish on the metal is a red oxide primer with final paint and was applied at the job site after installation.